Iva frutescens.Arthur Haines.New England Wild Flower ociety.gobotany.newenglandwild.org. (Accessed 7/2014). Iva frutescens is a shrub, 0.5-3.5 m tall, bark rather smooth, most stems tend to die back to base during winter making it rather herb-like. 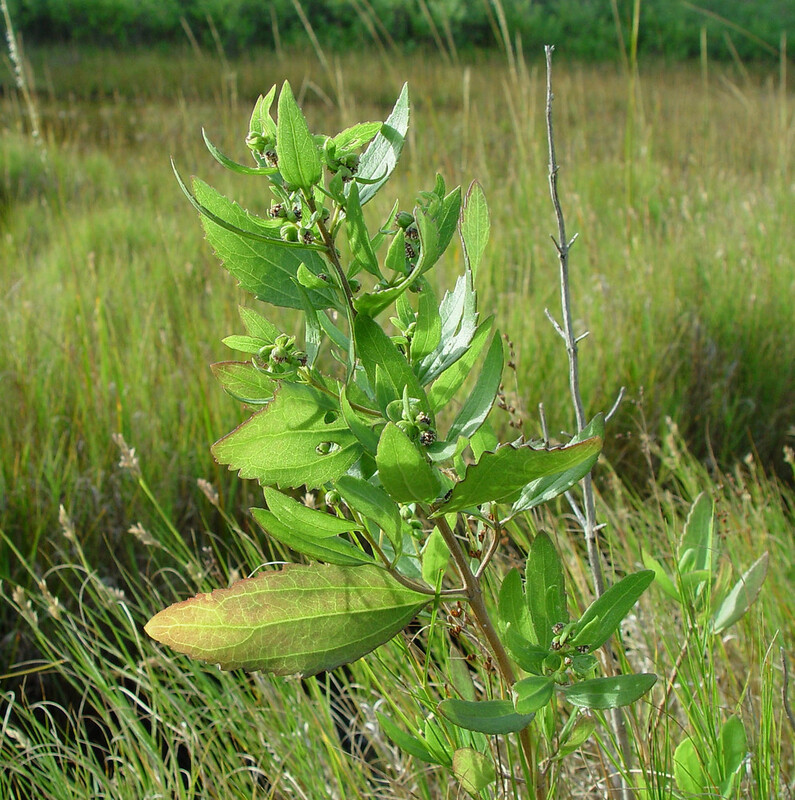 Leaves opposite below, alternate at branch tips, 4-10 cm long, 1-4 cm wide, gray-green, rather fleshy, margin sharply toothed; leaves expand mid-May (Britton 1874). Flowers small, greenish radially symmetrical, tubular, not plumed, female flowers 4-6, male flowers more numerous, anthers yellow; in a compact head arising from a bract-covered base 0.2-0.4 cm long, bracts 4-6; blooming and fruiting Aug.-Oct.
Fruit dry, 1-seeded, with numerous resin dots (use lens); probably water dispersed. Frequency in NYC: Occasional, but more common near and in salt marsh areas. Iva frutescens.Arthhur Haines.New England Wild Flower Society.gobotany.newenglandwild.org (Accessed 5/2014). 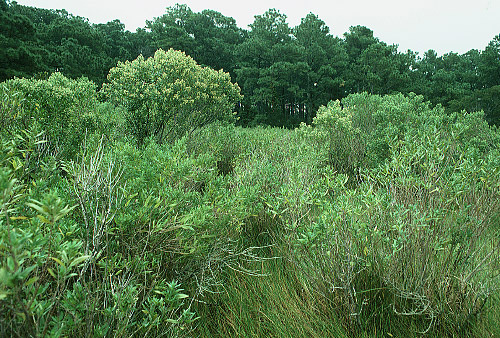 Habitat: Brackish and saline open wetlands, salt marshes, not shade tolerant, soil pH 5-5.7 (USDA, NRCS 2010). Notes: Very like Baccharis halimifolia but generally found in wetter soil than is Baccharis. Foliage eaten by Paria thoracica, a Chrysomelid beetle (Krischik and Denno 1990).